Weekly pool therapy has changed Kevin Fuson’s life and restored his mobility. Exercise has been and continues to be an essential component in Kevin’s recovery process. His dedication to recovery, positive attitude, and volunteering efforts are exemplary. Kevin sustained an Acquired Brain Injury and experienced significant memory loss. Eventually his memories returned and became a source of motivation. For two and a half years he didn’t even consider getting out of his wheelchair. The return of his memories changed his perspective, especially when he could recall playing hockey from 2 a.m. until 6 a.m. prior to his injury. Kevin played sports his whole life and considers it an important social and physical activity. This compelled him to look online for potential exercises and he discovered pool therapy. “Exercise was the one stimulant to evolve the brain. Exercise is paramount. The more exercise I did, the more memory I got back,” Kevin said. After five visits Kevin was able to throw his walker away. He paid for the lessons out of his own pocket at the Aldergrove heated pool and continues to attend once a week. 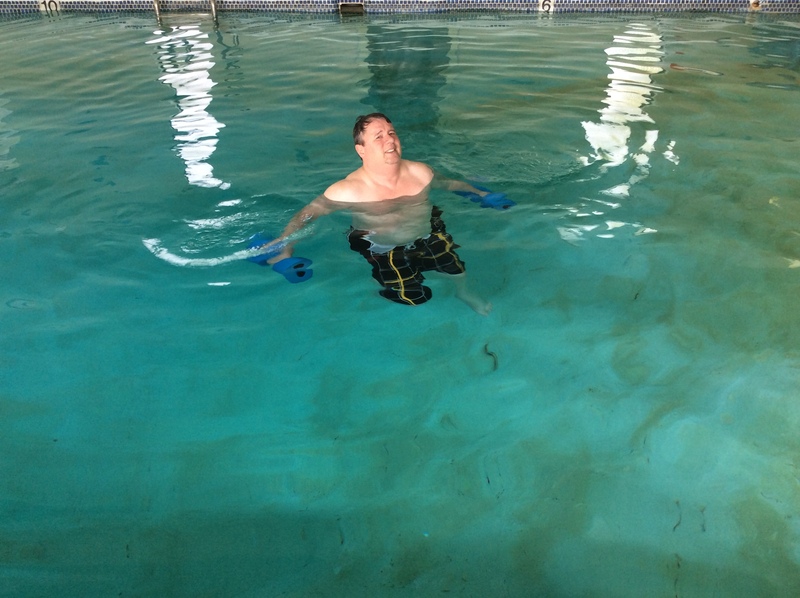 Pool therapy allowed Kevin to walk again and became the key to his recovery. Kevin is a member of Strive Living Society’s Assisted Independent Living (AIL) program and resides with a Home Share provider. His progress has been in learning tasks such as cooking and cleaning and has been progressing to more independent tasks on a regular basis. He continues to volunteer his time regularly and pool therapy has made him completely mobile. Kevin is driven to utilize the program and all that it has to offer. His positive attitude and dedication towards fitness is inspiring. Kevin says that his experience in AIL has been fabulous so far and that his care providers are a great fit. They joke around all the time and his cooking, household tasks, and cleaning abilities have improved noticeably. Everything has been a big learning experience and he continues to explore his newfound freedom. He has some advice for others going through a similar journey. “I would say don’t be so concerned about the memories. It was like I was living it but I couldn’t put names or faces or times. The hardest part was when the memories came back. Memories turned into motivation. I’m getting better and braver every day,” Kevin said. Kevin recommends asking about pool therapy right away in order to expedite the process of receiving funding. He prefers heated pools because it is harder to pull a muscle. Kevin has volunteered his entire life and started out by coaching sports, police runs, and walks for multiple sclerosis. He enjoys assisting people at Brookside on and off buses, and to picnics. He wants to help people experience things they may not be able to without his help. What compels him to keep volunteering? “Maybe my volunteering is a way of giving back because I have an appreciation of people in those positions. Living through it gave me a chance to speak one-on-one. Prior to my disability I didn’t even know these places exist. That’s what makes me come back. I get a chance to give back,” Kevin said.